Three children were killed last night in a dangerous crush by the front door of a hotel hosting a St Patrick's Day youth disco in Northern Ireland. Two boys aged 16 and 17 and a girl aged 17 died after a large crowd of young people are believed to have pushed up against the Greenvale Hotel in Cookstown, County Tyrone, causing dozens to fall to the ground on top of one another. Witnesses told of scenes of panic, with as many as 100 teens pushed off their feet and trapped in a press of bodies, as shocked onlookers attempted to resuscitate youngsters pulled out of the crush by emergency services. A 16-year-old girl is in a stable condition in hospital, while a further two teenagers were treated for injuries they suffered during the incident at about 9.30pm. One teenager told the Ulster Herald he was pinned down with other youngsters on top of him, in a crush of almost 100 teens who had fallen to the floor, for about 20 minutes. He explained that as the queue of teenagers were at the gate 'everyone just started swaying back and forth', and pushing side to side, and then there was a rush forward and the queue 'collapsed' with many people falling to the ground. ‘There must have been 20 or 30 who fell first,' he said, 'and then everyone else just followed. I’d say there was more than 100 who were in that queue and fell. ‘I was pinned down with others on top of me. We must have been there on the ground for 20 minutes unable to move. It was absolutely terrible. 'I didn’t know what was going to happen or how I’d get out. Eventually I was pulled out and thankfully was able to walk away. Police Service of Northern Ireland Assistant Chief Constable Mark Hamilton, speaking from the scene, said: 'Our preliminary investigations show there was a crush towards the front door of this hotel, and in that crush people seem to have fallen. In addition to the three teens confirmed to have died, a 16-year-old girl is in a stable condition in hospital, and a further two teenagers were treated for injuries they suffered during the incident. ACC Hamilton added: 'We are of an open mind ... it looks like a crowd of young people, a large crowd, pushing up against the front of the hotel to get in to this event. 'People then seem to have fallen and then got crushed. I would urge you to use that with some caution. Certainly it appears to be at the minute a crush, people have fallen and then been fatally injured. But in confusing scenes, other witnesses denied there had been a 'crush' with the venue's DJ claiming a 'number of young people had become seriously ill'. Emma Heatherington, 42, of Donaghmore, whose two sons, aged 17 and 18, had been at the event, told how she 'felt sick' when she saw the police appeal. She said: 'My two boys were there so I rang them, shaking and thankfully got them both. They were on their way home at that stage. 'They say there was a huge crowd waiting to get into the venue and then a lot of commotion up near the front of the queue. Meanwhile a source told Belfast Live: 'This is a desperate situation on what should have been a fantastic night. It will be memorable for all the wrong reasons now. 'A lot of people had congregated outside the Greeenvale and there was a lot of carry on but suddenly all hell broke loose and there was a big panic. More than a dozen police cars and 21 fire engines arrived at the scene to help with the emergency. Police said this morning the incident occurred before the doors of the venue were opened. A member of staff at the nearby Glenavon Hotel said he had heard the sirens as emergency services rushed to the scene, and police borrowed their defibrillator. The Northern Ireland Ambulance Service (NIAS) said it had received several calls from about 9.30pm last night and sent two rapid-response paramedics, two doctors and five emergency crews to the scene. 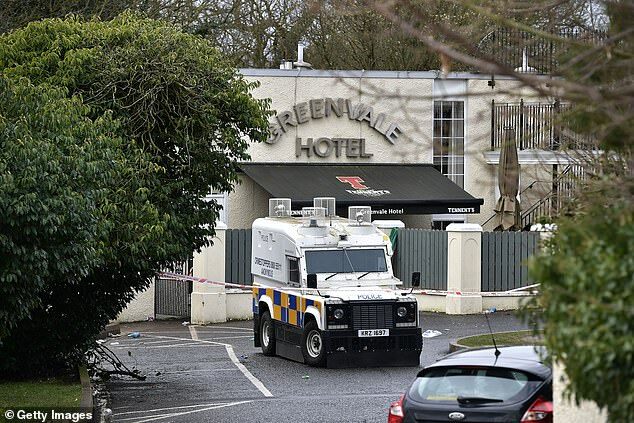 Colin Neill, chief executive of Hospitality Ulster, said: 'We are devastated to hear of the confirmed PSNI report of at least two deaths this evening at the Greenvale Hotel in Cookstown. Democratic Unionist Party leader Arlene Foster tweeted that her 'thoughts and prayers' were 'with everyone impacted by this tonight'. Former Democratic Unionist MP for South Antrim William McCrea said: 'We've got to see what lessons can be learned from this tragedy. 'I drove past this ten minutes before it happened, not knowing that ten minutes later an absolute tragedy would happen. The Northern Ireland Secretary Karen Bradley said this morning she was deeply sorry to hear the news and sent her thoughts and prayers to those involved. ACC Hamilton added: 'We are continuing to interview people who were there to establish the full facts and I would appeal to anyone who witnessed what happened to contact police on 101 ext 52014.